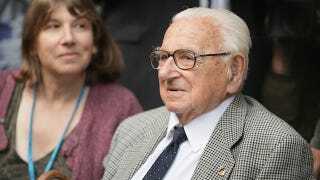 Nicholas Winton—whose tireless efforts helped save more than 600 children from the Holocaust—has died at 106. It involved dangers, bribes, forgery, secret contacts with the Gestapo, nine railroad trains, an avalanche of paperwork and a lot of money. Nazi agents started following him. In his Prague hotel room, he met terrified parents desperate to get their children to safety, although it meant surrendering them to strangers in a foreign land. As their numbers grew, a storefront office was opened. Long lines attracted Gestapo attention. Perilous confrontations were resolved with bribes. Eventually he registered more than 900 children, although he had names and details on 5,000. In early 1939, he left two friends, Trevor Chadwick and Bill Barazetti, in charge in Prague and returned to London to find foster homes, raise money and arrange transportation. Winton used his own money when funds ran short. And when the paperwork wasn’t fast enough, well: “We forged the Home Office entry permits,” he remembered later. About 250 children, the largest group, were on board the last train out, on Sept. 1, 1939. On that day, however, Hitler invaded Poland, all borders controlled by Germany were closed and Mr. Winton’s rescue efforts came to an end. “Within hours of the announcement, the train disappeared,” he recalled. “None of the 250 children aboard was ever seen again.” All were believed to have perished in concentration camps.